The headline over an interview Israeli Prime Minister Netanyahu gave to Bloomberg’s Jeffrey Goldberg was Netanyahu: There is nobody to negotiate with in Ramallah. In a sense Netanyahu is correct. There is nobody in Ramallah for him to negotiate with but that’s because Israel’s “minimal set of conditions” require the Palestinians to abandon their struggle for justice and accept crumbs (a few Bantustans here and there on the occupied West Bank) from Zionism’s table. It really does seem to me that Netanyahu learned much from the Nazis. I think it can be said without fear of contradiction that Zionist propaganda has deprived most Israeli Jews and very many Jews everywhere of independent thought on the matter of justice for the Palestinians. 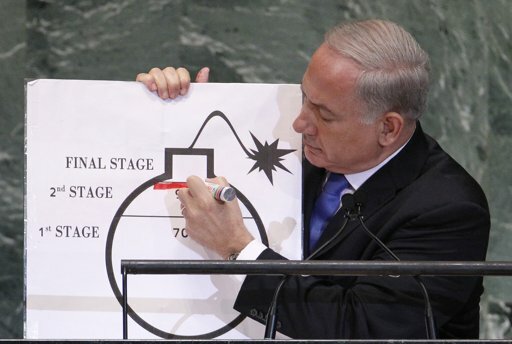 Nobody is better at doing that than Netanyahu. Despite his outrageous propaganda assertions to the contrary, the plain, simple truth is that there is no military threat to Israel’s existence from the Arab and wider Muslim would including Iran. And unless he is deluded to the point of clinical madness, Netanyahu must know that. (So he’s either a liar or nuts). Secretary of State John Kerry’s frantic efforts to secure a peace agreement between the Israelis and the Palestinians has failed, like so many efforts before his, because of three major reasons that make the Israeli-Palestinian conflict one of the most intractable conflicts in the world today: the disparity in power between the warring parties, the essential nature of the Zionist enterprise, and the underlying psychological dynamics of the conflict. The US provides Israel with three billion dollars annually in financial and military assistance and according to a US Congress report has provided Israel with 112 billion dollars since its birth in 1948. Of equal importance, the US provides Israel with total diplomatic immunity by exercising its Security Council veto to ensure that Israel is never held accountable to the many General Assembly and Security Council resolutions condemning its occupation and oppression of the Palestinian people. The founders of the Zionist movement (in 1897) were secular Jews who nonetheless appropriated God’s promise in the Bible to legitimate their colonization of Palestine even as they sought to secularize Jewish life and free it from the grip of religious orthodoxy. The Israeli historian, Ilan Pappe, once wryly observed that the founders of the Zionist movement did not believe in God, but the God they did not believe in nonetheless promised them Palestine. Since its inception as a political movement, Zionism aimed at the creation of a Jewish state in a land populated by another people who had been living there continuously for many centuries. Political Zionism, as acknowledged in the writings of virtually every major Zionist politician prior to the establishment of the state of Israel, saw itself as a colonizing movement that could only succeed if the Palestinian people were dispossessed from the very land that was eyed as the future Jewish state. In as much as the Jews were a small minority and the Palestinians, Muslim and Christian alike, comprised the vast majority, expelling them was a necessity built into Zionism from the beginning. Vladimir Jabotinsky wrote about this most candidly and since then virtually every major Israeli political party has seen its task as acquiring as much land as possible while ridding it of as much of the indigenous Palestinian population as possible. Today we call this ethnic cleansing. The famous Zionist rallying cry, “a land without a people for a people without a land,” was pure nonsense and sophistry, designed for internal consumption and to win support from the outside world. The tragic truth is that the Zionist movement, created to remedy Jewish victimization, ended up victimizing the people of Palestine who had nothing to do with the centuries long anti-Semitism Jews had experienced throughout Christian Europe. To put it simply, the Zionists solved their European problem on the backs of the Palestinian people. Thus any just and sustainable solution to the conflict would require Israel to abandon the very essence of the Zionist project because it is incompatible with compromise and sharing the land. This de-Zionization would be tantamount to Israel abandoning its ideological birth mother. This dilemma accounts for Israel’s bad faith and intransigence in its negotiations with the Palestinians. Abandoning one’s cherished identity does not come easily and requires much courageous soul searching and internal education. Glick went on to say that many Jews carry within their historical DNA the trauma of the persecution experienced in Christian Europe which climaxed with the Nazi holocaust. For many Jews this has resulted in a kind of psychological sickness, a deeply felt conviction that they are the eternal victims. This has resulted in an inability to reflect honestly about their own behavior toward the Palestinians and their other neighbors in the region… It is essential that we Jews face our inner sickness and work to heal it. As long as we wrap ourselves in the righteous mantle of the eternal, innocent victim, we will avoid responsibility for our part in creating and perpetuating this tragic conflict. Perhaps what Netanyahu needs most of all if he has any interest in negotiating with the Palestinians is some sessions on the couch with psychotherapist David Click. For those who deny and/or are unaware of the fact that Zionism is continuing its ethnic cleansing of Palestine slowly and by stealth, I recommend an Al Jazeera documentary currently being aired with the title Area C.
A superb essay, as I have come to expect. I wish the mainstream media had your morality to tell it as it is. I too am a psychologist and would diagnose Israel as suffering collectively from a delusion-based compulsive abuse disorder to which a 12-step treatment program could apply. In our Palestinian solidarity work, we evoke cognitive and moral dissonance to expose and challenge the delusions, testing Zionist defense mechanisms to the breaking point and beyond, at which point it becomes clear that Zionism is an addictive disorder that must be given up like alcohol to an alcoholic. I think the key steps are the "fearless moral inventory" (confession of crimes) and restitution to their victims (atonement), which heals anger on one side and guilt on the other, repairing both the damaged self and the damaged relationship. The cost would be loss of Jewish majority and supremacy in Palestine. The gain would be a normal democratic, multi-ethnic country, accepted by the world community. Well, it depends who is lying; Netanyahu or Shimon Peres. According to Peres, Ramallah is ruled by no other than Peres' best friend and Palestinian Gandhi - Mahmoud Abbas. Free our American U.S. House. from six pointed zio stars. Thank you for contacting the Office of the Clerk. There are unfortunately no published images that show a detail of the stars at the joints of the seats in the current House Chamber, on the internet or in print. The current style of furniture was installed in 1949, and was manufactured by a New York furniture company called Knip, which is no longer in business. There are drawings for both five and six -pointed brass stars associated with the design of the furniture, but there is no documentation explaining or mentioning the use of the six-pointed version. Jack says restitution is needed, but I do not grasp how that might truly resolve the land rights issue. Jack, have you thought this through? Restitution is a broad concept contrasted with retribution as a model of justice. In this case, it would certainly include the right of return and property restoration. Displaced Palestinians often retain the deeds, titles and front door keys (their symbol of this right), with UN-registered claims against Israel. These properties would have to be returned, replaced, or fairly compensated through individual negotiations with each claimant. The Israeli NGO Zochrot has studied and developed a plan for implementing this right and considers it feasible. Should a claimant demand return of a property now occupied by an Israeli, the claimant should have priority and Israel would be obligated to compensate the displaced Israeli.